Below you will find a list of all the InstaCasino bonuses - offered to new players. The right side offers a casino overview (click to scroll through the images). 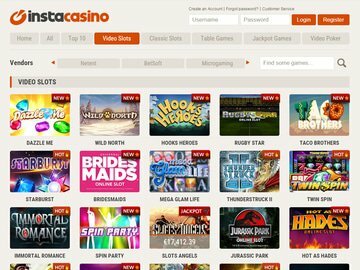 InstaCasino is a brand new gambling website from the Gaming Innovation Group. Although it hasn't launched just yet, we are excited to bring you all the details. The site will have over 400 games from top software providers such as NetEnt, Microgaming, Play n'Go, NYX Gaming, and Betsoft. As well as this there is also a mobile casino, live dealer games, and round the clock support. Canadian players are in for a treat with a special new player sign up bonus that will see them get free spins and free casino cash. We had the pleasure of interviewing the brand manager to see what InstaCasino is going to bring to the table for players from Canada. During our interview we learned that this online gambling site is already very popular in Scandinavia and their planned expansion into Canada will come with excellent bonuses and promotions that will appeal to players from all provinces and cities. We expect the initial new player numbers to be made up of people from larger cities such as Toronto, Ontario, British Columbia, Winnipeg, and Manitoba, but if their reputation is as good as they say, we expect that their player appeal with spread throughout Canada quite quickly. The InstaCasino bonus for new players from Canada is a 100% up to $1,000 CAD first deposit offer plus 50 free spins on Avalon 2 or Hot as Hades. 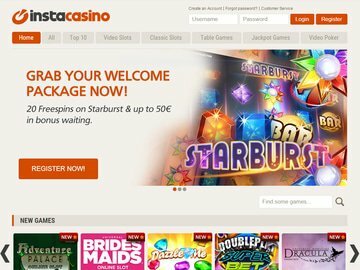 This is quite a good opening bonus and although they don't have a no deposit offer, the free spins could see you winning quite a lot of cash. There is no bonus code required and the new player offer is added to your account automatically once you register as a real money player. We don't yet know what the wagering requirements or terms and conditions for this promotion will be but we will revise this once the information becomes available. We don't as yet know what the promotions for returning players will be like but we are hoping to see some cash back rewards, additional free spins, perhaps a no deposit bonus, and more. We will review these once the site officially launches. InstaCasino will offer games from NetEnt, Microgaming, Play n'Go, NYX Gaming, and Betsoft. This means that Canadian players will get to choose from the best titles around. The Microgaming QuickFire platform allows Insta Casino to offer titles from a large number of smaller developers too including Genesis Gaming, Quick Spin, and Thunder Kick. The software is available in no download, instant play flash options and the games load really quickly in your browser. The games actually open in a layer above your casino lobby which means you don't ever have to reload our lobby when you want to change games. A free play option is available for those who wish to test out the games before making a deposit. When it comes to games, there are over 400 to choose from with more being added on a regular basis. There is a great selection of video slots games from Microgaming, Net Entertainment, and NextGen Gaming. Titles such as Avalon II, Fruit Shop, Jurassic Park, The Invisible Man and more are all available. There are also plenty of table games such as blackjack, roulette and baccarat. Video poker and scratch cards are also featured. Those who prefer gaming on the go can enjoy the InstaCasino mobile offering. The mobile casino app is available on smartphone and tablets and works with all operating systems including Apple's iOS and Android. There are almost 200 games available on the mobile casino and all have been optimized to include swipe and tap gestures. If you have an iPhone or iPad you will enjoy watching the graphics come alive on your retina display screen. Game play is very smooth and you can choose from slots, table games, video poker, and more. If you want more interaction you will love the live dealer games that InstaCasino has to offer. There is live blackjack, roulette, and baccarat with plenty of variations to choose from. The live casino software comes from NetEnt and is excellent. The dealers are very friendly and professional and interacting with them is a breeze. InstaCasino has a range of banking options that will suit everyone. They will launch with Visa, MasterCard, Trustly, Paysafecard, Skrill, Neteller, Poli, and EcoPayz. Further information on all of these will be available on the casino website once it launches. The casino will also be available in multiple currencies and again this will be available to select on the website. Support will be available 24/7 and Canadian customers will be able to get instant help on any queries they might have. Numerous support languages are also available including French, English, Swedish and more. Customer support is available via live chat, email, and phone. For players in Canada looking for somewhere new to play, InstaCasino is a great choice. They are using top software providers and have a multi-lingual and multiple currency offering. A mobile casino as well as a live dealer casino is available. As far as the InstaCasino bonus for new players goes, it is quite a good deal. You get a 100% first deposit bonus up to $1,000 and 50 free spins. There isn't a no deposit offer but you can test out the games in fun play mode before you decide to make a deposit. You don't need a bonus code to redeem the bonus either. With over 400 great games to choose from there is something to suit all players and the graphics and gameplay are excellent too.